London On A Plate is unique map of London for adventurous palates, curated by author and journalist Charmain Ponnuthurai and host of passionate food experts and London society celebrities. Original recipes from diverse cookbooks and talented Michelin star chefs. A treasure-trove shopping guide for unique fashion, furniture and produce sources in the city. 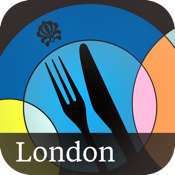 London On A Plate is a notebook-inspired, pocket-sized guide for residents and visitors seeking the finest cuisine London has on offer, any time and any place, and the handy built-in GPS makes locating both hidden gems and nearest food spots a stress-free affair. Your memorably delectable London experience starts here. Free, and available for iPhone and iPod.